A diagnosis of cancer brings many changes to individuals’ lives, thus becoming part of their identity. Individuals who have cancer typically struggle when adjusting and accepting these changes (Blennerhassett, 2008; Yang, Staps, & Hijmans, 2010; Allen, Savadatti, & Levy, 2009; Lindwall & Bergbom, 2009; Lewis, 2008; Welsh & Guy, 2009; Frith, Harcourt, & Fussell, 2007; Hilton, Hunt, Emslie, Salinas, & Ziebland 2008). Furthermore, medical doctors place more emphasis on the symptoms and side effects individuals undergo rather than the person’s experience of the symptoms and side effects (Frank, 1991; Cassell, 1991; Nuland, 2010; Couser, 1997). During this time, some individuals engage in creative tasks, such as painting or writing, as means of coping. This current study will explore why individuals use creativity to cope with cancer. 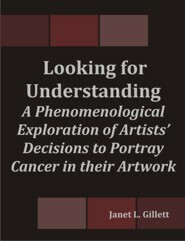 Interviews with seven individuals were interpreted using a phenomenological methodology to highlight the recurrent themes among the participants. Three reasons for creating art reoccurred through many of the seven situated structures: to communicate their experiences, to connect to others, and to face their vulnerabilities. By understanding these themes, interventions and programs can be created to help individuals while they undergo cancer treatment and after the cessation of treatment.